On 17 January 2018, PASS (Proof of Age Standards Scheme) launched a new design to reflect support from the National Police Chiefs’ Council (NPCC) whose logo is now shown on the cards. View the full press release. The PASS card scheme is operated by a Community Interest Company providing accreditation to suppliers of Proof of Age Cards in the UK. The card suppliers are assessed against strict standards by qualified auditors to ensure that they operate to the highest standards. Sellers of age restricted products can be confident in accepting cards with a PASS holograms, safe in the knowledge that the scheme is supported by the police, trading standards and a wide range of trade bodies. Carrying a card bearing the PASS hologram means young people can gain access to the goods and services to which they are legally entitled without having to risk carrying more costly documents such as passports or driving licences. When a young person produces any card bearing the PASS hologram, the retailer only needs to check the photo and the date of birth, and the sale can proceed. This saves a massive amount of time for the retailer along with giving them peace of mind. The PASS Scheme was launched in 2000 to combat fake proof-of-age cards which were becoming a widespread national problem. Providing a reliable, robust and recognisable ‘proof of age’ supported by enforcers, to help those who sell age-restricted products avoid selling illegally to under-age customers. What are the benefits of PASS cards? By producing your PASS card you should be able to obtain the products and services that you are legally entitled to, without embarrassment, particularly if you are fortunate enough to look younger than you are! The benefit of carrying a PASS approved card also means that you don’t need to carry valuable documents such as your driving licence or passport. Every card that carries a PASS hologram will have been issued by a provider who has been through a stringent application and accreditation process. Production of a PASS hologrammed card at the point of sale affords retailers and their staff the confidence of knowing that the card is a trusted and secure form of identification. The unique PASS hologram is registered Trademark making it a criminal offence to manufacture cards that have a mark similar to the PASS one. 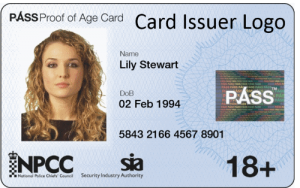 Possession of a PASS accredited card demonstrates your age and personal details have been verified by your card issuer and you are who you say you are! What people are saying about PASS. "Young people are rightly concerned about taking their passport with them on a night out, due to the risk of theft or loss, and they require a reliable document in order to prove their entitlement to purchase age-restricted goods. The Government fully supports the Proof of Age Standards Scheme (PASS) and encourages all shops and licensed premises to accept PASS accredited cards as proof of age." "This relaunch of a valuable tool in safeguarding young people in the night time economy is especially welcome. The new Pass card standardises not only the look of the card, but the responses of premises licence holders, SIA staff and Licensing and Police Officers in their response to underage admission issues. As such, we are wholeheartedly behind it." "The protection of young people from alcohol abuse is a significant feature of the licensing objectives as stipulated by Central Government. Standardising a readily acceptable form of identification - such as this PASS card - gives much greater clarity to the trade and most importantly, the public, in realising this laudable objective." © 2017 PASS Scheme. Design byCCH Creative.